Sam Amidon reclined in a chair, folded his arms over his eyes, and swiveled quarter-turns back and forth as we listened to a take of Wild Bill Jones. The story was unfolding, genuine and somber. Wild Bill had just been shot, and my eyes opened wide as Sam’s voice on the playback suddenly let out an awful, extended moan: Aaaaaaaaaahhhhhhhh! “That was a good one.” Sam said with a grin. I wondered just how much was going on inside that mind. And just how he’d gotten to this point—working on his third folk-inspired CD in the last three years. It was such good fortune that Sam invited me to the studio that day—having the pleasure of hearing a song or two that will be on an upcoming CD. After the session we sat down and talked. And there was lots of energy and excitement in what he told me. Singing, traveling with his parents: great fun for the young Sam Amidon. In one way, yes, he did grow up with folk music. But in another way he wasn’t consciously into it. And he didn’t quite consider himself a singer. He was also cultivating an affinity for free jazz violin, and the desire to study in New York. Soon he’d get there. Summertime in Harlem. And ultimately, it was an empty house for Sam. His housemate (childhood friend and another supremely talented musician, Thomas Bartlett) would be touring for almost the entire season. 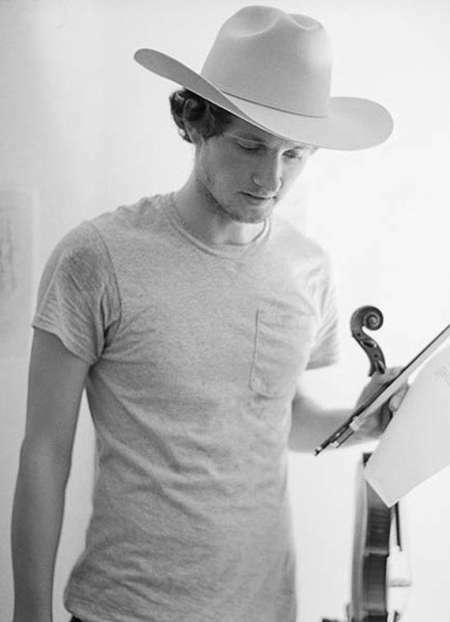 With all that time and space not only did Sam study free jazz violin, but he also began teaching himself how to play the guitar—setting folk songs to the instrument to help him learn. He’d come up with a riff or a melody and play it for days straight. And almost accidentally other melodies and lines would fall on top. Sometimes perfectly. Other times a clash, unintended—but equally terrific. For Sam, these were origins of the folk CDs he has since created. But more to the time, it allowed him personal discoveries and the chance to reach out, musically. And beyond all of this, Sam was drawing comics. And break-dancing. And making bizarrely hilarious videos with a camera his parents had given him (search “Sam Amidon” on YouTube and watch, please). It was a brilliant assortment of art. Then all those disparate things somehow converged, as Sam began performing folk songs at shows. You’ll hear just how much Sam embraces those things, and also how much his other influences come in on his CDs (But This Chicken Proved Falsehearted and All is Well) and during his shows. I think more than anything, what catches me is Sam’s voice. It’s so well suited for storytelling and lamenting that sometimes it almost hurts to listen. It’s difficult to explain exactly, but there's something very human and something easy to relate to—something very alive and tender and honest-hearted about his voice. And it’s the storytelling part of Sam. He really does it with each song. No, he didn’t write the melodies. The lyrics aren’t his. But he’s put something of his own particular nature into the songs. And you can do that with folk. Maybe that’s even the purpose. Sam mentioned that although it is true he grew up with a lot of folk songs, it’s a little misleading; that he really has no claim to the music that somebody else doesn’t; that he found them on iTunes, and not trudging through North Carolina; that it was just links from one person to another. Yet there’s something there—in his voice and how he tells the story—it’s like he’s made himself into one of those links back to another link, back to another. Folk music lends itself to that. It’s a music that’s meant to survive. With Sam’s music I can hear that.